I really thought that yesterday’s blog would be my last for this mission. But an amazing God-incidence happened to myself and Maria yesterday and I thought I would share it with you, as another example of God continuing to “unfold” the day for us.. The church is situated in “artists Corner”, a courtyard containing a myriad galleries and little shops . As we strolled around after visiting St Blaise’s church, we saw a sign advertising “The Meeting Place” cafe, so we went in. We were surprised and delighted to meet Keller, one of the translaters we used during our clinic time at La Fuente. With him were a young English couple who were helping out at the cafe. They had to close soon after we arrived, as they were going to run an after school project outside of Cusco. We returned to the cafe today and met Roland, another English guy, who with his wife , ran the cafe and hosted an English speaking house fellowship on Sunday evenings in that very cafe. We also met the pastor of that fellowship, a guy from Texas called Joel, who knew all about the places we had been ministering at in Cusco, and who in fact was co ordinating another medical mission to the orphanage of Casa de Aguila where we ministered last Sunday . He ws full of questions as to what equipment and medications he needed to bring, and we were delighted to share our experience of our ministry there. Before we left, we had lunch and were invited by Joel to their fellowship’s bible study tonight. To cap it all, we met an English couple , whose church is Holy Trinity Brompton in London. This church is the one which gave the Alpha course to the world, which course has become a major tool for evangelism in the world. Maria and I took our leave, marvelling at how God had sovereignly opened up yet another door for us to network with other organisations which are operating in Peru. Just to add that over the last couple of days we have been praying with taxi drivers, a couple of guys selling sunglasses in the street, the son of one of the workers here in our hotel, who had a bad fall ten years ago and was still suffering headaches . As we prayed with this last one, his headaches completely disappeared.Oh yes, for those who were with us on our first mission trip, when we went to Cusco, you may remember us visiting a famous sculptor there, called Medina, who carved the most amazing figures of Christ in his Passion, and who we prayed with at that time, and received the gift of one of his pieces…well we returned to his studio to find he had , alas, died the previous June. But we did meet his daughter and ended up praying with her also. All in a day’s work !! Praise God, who in his goodness guides us along the right path , as Psalm 23 reminds us !! Please forgive the lapse into Texan ! It comes from spending the last few days in the company of a genial co ordinator from Houston who has been arranging the second part of our mission, in Cusco. We arrived here on Saturday, booked into our hotel and tried to aclimatise ourselves to the high altitude. This has caused a number of minor health complaints within the team, not helped by the number of steep hills we have to climb whenver we go out for a walk around town. On Sunday, we ran at a clinic at a farm/orphanage in Limatumbo, which is two hours outside of Cusco. This set up hasits own clinic with facilities very much better than we found in Huanuco. As a result, the people don’t have so much of a problem with worms and other complaints to do with poor sanitation. But even that situation was inferor to the clinic we ministered to on Monday and Tuesday , whihc had proper consulting rooms, and facilities for making blood and urine tests. The clinic rejoices in the name of La Fuente meaning “The Fountain” . It has own doctor and paediatrician, and is set in a lovely peaceful secluded courtyard . Over tha last three days we must have seen between us some 600 people and a final count over the entire span of the mission should approximate some 1500 people, children and adults, who have received excellent health care for free, from the dedicated group of professionals in our team. It has been a pleasure to be part of this mission, and to provide some spiritual devotion for the team each morning, as well as working as a translator with Gerry and Marion Roussie, who have been manning the Optical Aid sideof things, checking people’s eyes to find the right prescription for a pair of glasses. They have brought along over a thousand pairs of spectacles and the sheer delight on people’s faces when they get their classes and can at last see clearly to read or sew or weave or drive taxis, or just to be able to distinguish things and peopel at a distance, makes all the hard work worthwhile. Gerry and Marion have been very surprised to see how many of the people suffer from serious eye diseases. People also complained of various complaints from being out in the hot sun, so our supply of sunglasses was exhausted by the time the mission ended. With that, and the number of medications we gave out during our clinic hours , or left behind at La Fuente at the end,should mean the suitcases will not be as heavy going back as they were coming in. Each of the health care professionals on the team bring in their own equipment, dental chairs, stethoscopes, drills, eyeglasses, etc. I am so much in admiration at the hard work involved in carrying these cases around from place to place, and I myself am sure that the muscles in my arms now rival those of Arnold Schwarzenegger !! Today, the rest of the team, apart from myself and Maria , have gone on a sightseeing tour of Cusco and Machu Picchu for two days, and we look forward to hearing all about it when they return. Then, on Friday, we return to Lima and leave from there early on Saturday morning to return to Canada. I look forward to seeing y”all again on Sunday at Mass..
ERRATUM- the evening will be FOLK and not BLUES as advertized. 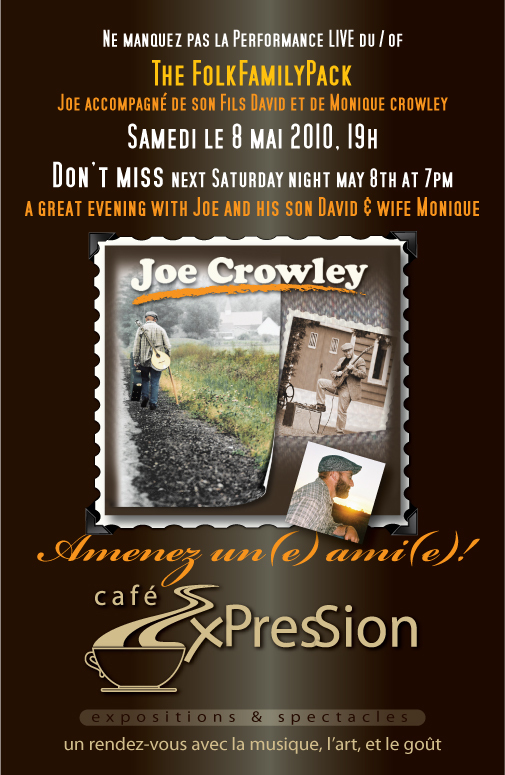 Joe’s son David from Montreal will also be joining his on stage, as well as his wife Monique, then a special ‘surprise’ guest in the second set of the evening. Venez en grand nombre déguster cette soirée en compagnie non de un M. Crowley mais de deux Monsieur Crowley ainsi que de Monique Crowley ce qui en fait trois! 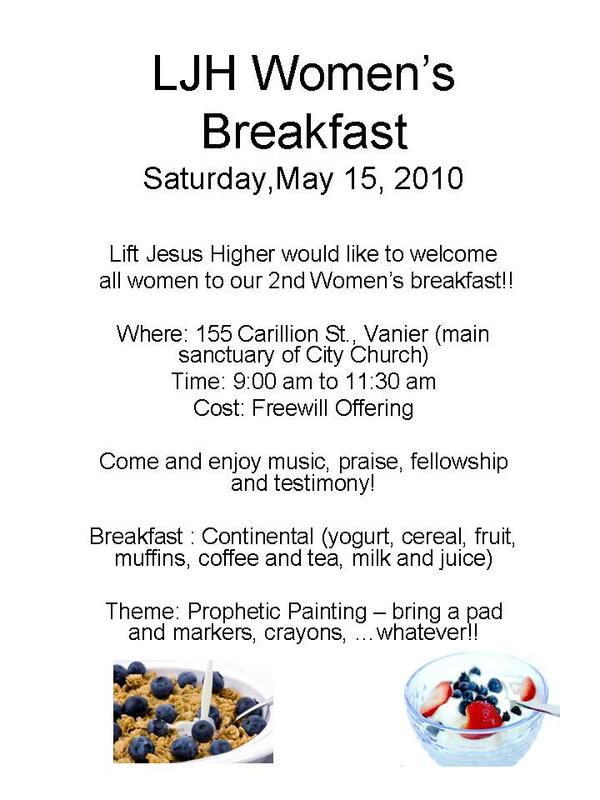 You are currently browsing the Lift Jesus Higher blog archives for May, 2010.